That’s the off-the-cuff formulation that emerged from the blogging session at our Mayo Clinic Social Media Residency on Monday. And today it becomes my 39th Thesis, joining the first 35, along with 36, 37 and 38. I’ve previously remarked that creating a brand page on Facebook is like puppy adoption. It’s fun at first. It can be messy, and requires lots of care and feeding. But especially with the declining organic reach of brand Facebook posts and the increasing need to supplement good content with paid advertising, a Facebook page can grow up to be a dog. In the context of our Residency discussion on Monday, it seemed the pony analogy captured the even more intense involvement required with a blog. You need to ride ponies regularly. You need to build or rent a barn to house them. Vet bills are more expensive. And as far as care and feeding goes, a pony eats like…well… a horse. None of this is to say that you shouldn’t have a Facebook brand page or a blog. But you might want to consider sharing one, just as my dad and his friend Jim Sorgine decided to get a pony together during my youth. 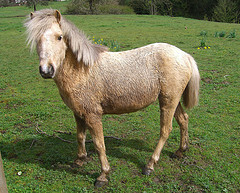 They each had two kids, and one pony was plenty for the four of us. Send us your posts for Facebook, and we’ll put them on the Mayo Clinic page. Write guest posts on one of our Mayo Clinic blogs. See if this is something you can keep up in the long term, and whether it’s something you’re really committed to building. If so, you’ve built great momentum, and we can help you create your own site. If not, you’ve gotten a bigger audience for your limited series of posts than you would have reached on your own. And you don’t have the long-term commitment. So, in a sense, the Mayo Clinic Center for Social Media is in the pony rental business. If you’d like to go for a ride, and your topic is related to social media in health care, you could join the Social Media Health Network and write a guest post. Or if you want to write something that’s about social media but not necessarily health-related, you could become a visiting professor at SMUG. For otolaryngologist Douglas Backous, MD, Twitter and blogging were “like speaking a foreign language.” So he went to his hospital and got himself a translator: Dana Lewis, hired by Seattle’s Swedish Medical Center to handle all things social media. Lewis is part of a trend in a new and growing type of hospital employment: the social media manager. Technically, she’s called the interactive marketing specialist. But she, and others like her, are being charged by their hospitals to handle such duties as overseeing their social media presence, communicating with patients through social media — and, in many cases, teaching affiliated or employed physicians how to use social media. The idea is that by having a person dedicated to social media, the hospital can use the technology to strengthen its connections with all of what organizations like to call their stakeholders, which include the physicians who refer patients through their doors. 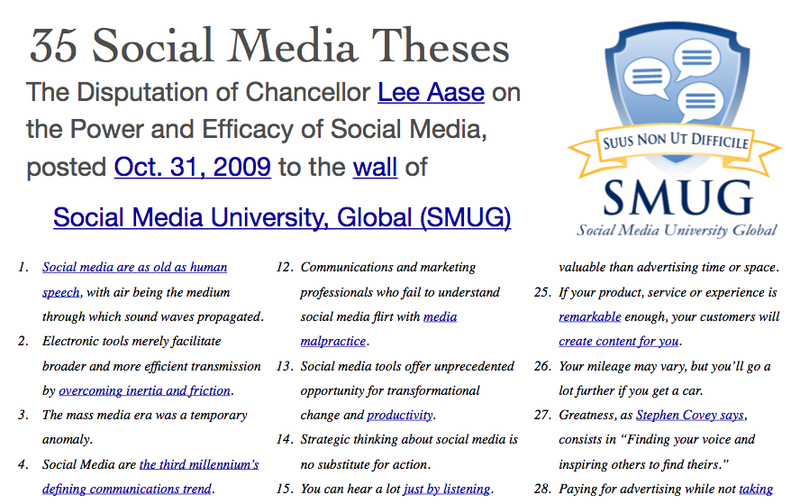 Check out the whole article: Ed Bennett’s Hospital Social Networking List also is featured, as are my 35 Theses here on SMUG. It also has a nice compilation of social media best practices for hospitals, which author Bob Cook apparently synthesized from several guidelines documents. Here’s more information on what we’re doing at Mayo Clinic, with our new Center for Social Media. I’m excited that we’ve hired candidates for four of the eight new positions with the Center, and that we have interviews this week and next for two more. I’m also honored that both Ed and Dana are on our advisory board (with 12 more members still to be named). We’re going through about 120 applications from some really strong candidates to ensure broad-based and diverse membership. When the official online publication of the American Medical Association devotes an extensive article to the topic of social media staffing for hospitals, that’s a good sign the activity is going mainstream. We’re glad to contributing to that through the Mayo Clinic Center for Social Media and the Social Media Health Network. Last week, I got a direct-message tweet from Amber Smith (@AmberSmith), a reporter from Syracuse, NY. I had met Amber previously (because of Twitter) and we have interacted via Twitter, and she was tweeting because she had seen some chatter about one of our Mayo Clinic videos being among the most-tweeted videos on Twitter. It’s about continuous chest compressions, a kind of CPR that doesn’t involve mouth-to-mouth. I have embedded that video below, but here’s the link to the in-depth story Amber did for Syracuse.com, as well as the sidebar about the viral phenomenon with this video (most of the nearly 3 million combined views as of this moment have been from a copy the Arizona Department of Health Services uploaded) and a post with more links to relevant research papers on Amber’s personal blog. This story is another example of both Thesis 9 and Thesis 33. The original video was produced as part of our Mayo Clinic Medical Edge news program for television stations, and the story ran in 2008. Now, because of the power of social media, it has gone viral, which has led to more mainstream news coverage, which will undoubtedly increase the YouTube traffic. And as a result, more people who are untrained in mouth-to-mouth CPR will be aware of the continuous chest compressions alternative. I hope you will take a couple of minutes to watch the video above, and also to read Amber’s story. Then I hope you will share this post (or the video) with your friends via email, or Facebook, or Twitter, or however you like to spread the word. If your organization can’t find a way to constructively use free tools that enable deep, two-way communication with anyone, anywhere, anytime, your real problem is lack of imagination. If someone gave you free and unlimited long-distance calling, or the ability to send letters through the mail without paying postage, would you not find ways to take advantage of those opportunities? Of course, with social media tools you don’t just get to send your messages for free: you also get to hear from key stakeholders, whether they be customers, prospects, employees or the community. If you’re comfortable with the status quo, you can be confident of one thing: you’re too confident. If you don’t use these powerful communication tools, a competitor will. And it may not even be someone you consider a competitor today. After all, Blockbuster didn’t see Netflix coming. 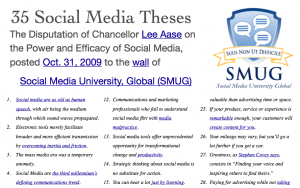 Which is, after all, what the first 35 Social Media Theses were all about. 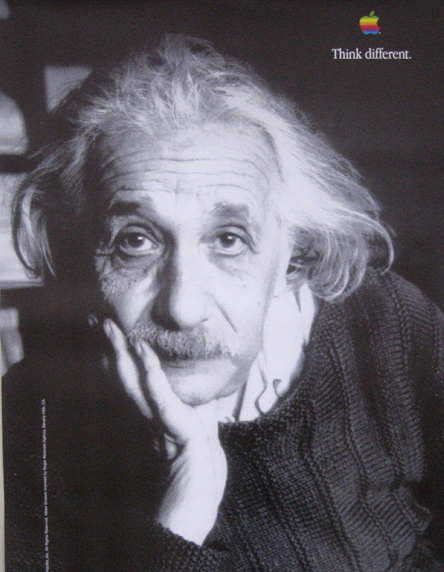 You don’t need to be an Einstein. Just think like MacGyver. Please feel free to make as many photocopies of the document as you would like. You also may email the file (it’s only 132K) to anyone you think would find it helpful. And of course, since this is about social media, I encourage you to tweet the link or otherwise share it on Facebook, LinkedIn or other platforms. Digg? The Creative Commons license simply requires that you not change the original document as you pass it along and that you credit the source. You will note that within the PDF I have included links to posts or news articles on SMUG or elsewhere that support or explain the various points. I hope this can be a good discussion starter for you in your workplace or in other organizations you’re trying to get involved in social media. Let me know how your conversation goes!